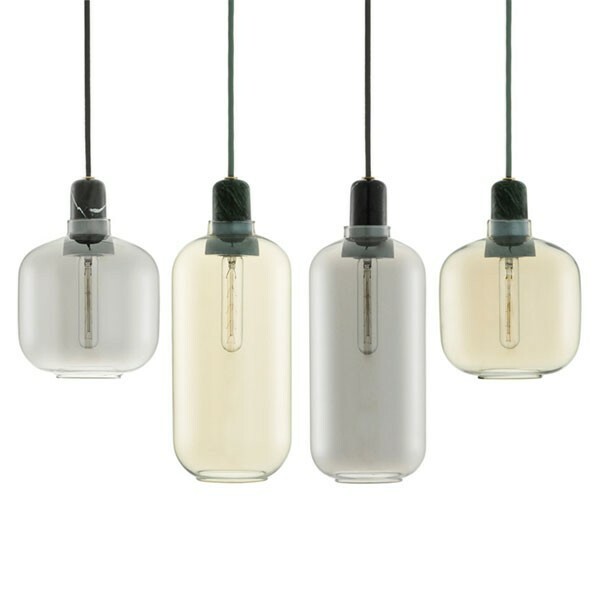 Add a stylish industrial flavour to your interior with this glass pendant light from Normann Copenhagen! Inspired by the old style tube amplifiers from the Sixties, the Amp Lamp Small in Smoke Black has been given a contemporary update with the use of marble and its hanging lamp form. By stripping the glass vacuum tube of its electrical components (which helped to magnify the sound), the result is a simple but stunning jar style hanging lamp, which will not fail to spark the interest of all your guests. Perfect for industrial-style kitchen spaces, this nostalgic design emits a stunning glow through the smokey glass. This unique hanging light comes with a matching textile cord. With the exposed lightbulb style and unique glass jar shape; this perfect pendant definitely has the wow factor! Plus, the versatility of the lamp allows you to display them in a cluster, or as one funky feature piece. The Amp Lamp comes in two sizes and two colours: smoke black and gold green - see these variations on the right hand side!